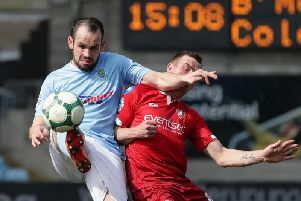 Willie Faulkner opened the scoring for Ballymena United on Saturday. A cool finish from Willie Faulkner at a sunny Stangmore Park set Ballymena on the road to victory. It was a much-changed Sky Blues team that took to the pitch on Saturday. A busy summer of recruitment had brought a host of new signings, with five of them in the starting line-up. However, the scorers of the two goals against the Swifts - Faulkner and Tony Kane - were familiar to fans. Ballymena started well and nearly took a fourth minute lead. A poor clearance fell to Jonathan McMurray, who played in Ryan Mayse, and his shot landed just wide. The same two combined later in the half. Mayse had the assist, with McMurray shooting wide from a glorious position. Ballymena went in front in the 32nd minute through Faulkner’s fine finish. He ghosted into the box to collect a pass from Steven McCullough before lobbing young Swifts goalkeeper Alex Moore. Dungannon stepped it up in the second half as they sought a response. Cormac Burke, Daniel Hughes and Chris Hegarty all had chances but none of the efforts landed on target. Instead Ballymena got the all-important second goal in the 55th minute. Mayse, who had a fine game on his Sky Blues debut, was fouled in the box by Hegarty, who was booked. A penalty was given and Kane took the kick, sending the goalkeeper the wrong way from the spot. Dungannon’s afternoon got worse when Hegarty was shown a second yellow card in the 67th minute and sent off.